Here will briefly review the twelve primary Qi channels along with the eight extraordinary meridians. You should also know the organ's Yin and Yang. In our body, there are six Yang organs and six Yin organs. Each Yang organ is associated with and harmonized by a Yin organ. Here will briefly review the twelve primary Qi channels along with the eight extraordinary meridians. You should also know the organ's Yin and Yang. In our body, there are six Yang organs and six Yin organs. Each Yang organ is associated with and harmonized by a Yin organ. Paired Yin and Yang organs belong to the same phase in the Five Phases. Their channels are sequential to each other in the circulation of Qi, their functions are closely related, and disease in one usually affects the other. 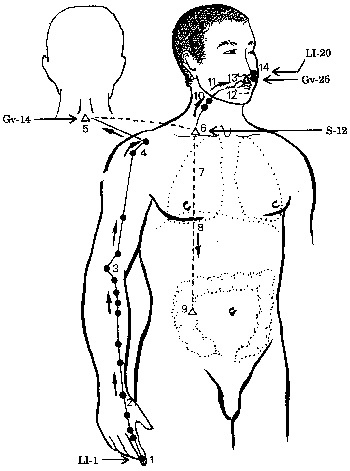 In Chinese medicine, the channel corresponding to the Yang organ is often used to treat disorders of its related Yin organ. Breathing is considered a strategy for leading Qi to the extremities such as skin and hair. When your breathing is regulated properly, you are able to strengthen your body's Guardian Qi and generate an expansive Qi shield to protect your body. You are also able to raise or lower your Qi state through your breathing. For example, when you are angry, deep breathing is able to calm your excited Qi state. The lungs (Yin) and the large intestine (Yang) are considered paired organs. They belong to Metal in the Five Phases, the westerly direction, the season of autumn, the dry climatic condition, the color white, the pungent taste, the rank odor, the emotion of sadness, and the sound of weeping. Their opening is the nose, and they govern skin and hair. The main function of the large intestine is the metabolism of water and the passing of water. It extracts water from the waste material received from the small intestine, sends it on to the urinary bladder, and excretes the solid material as stool. Many disorders affecting this organ are categorized as spleen and stomach patterns. Certain abdominal pains are considered manifestations of a blockage of Qi or blood in the large intestine.